Come Visit Us at the Community Connections Conference this Saturday! Check out the Promise Zone's workshop (All About the Benjamins: Tips for Community Orgs Seeking Government Funds) on how to secure federal funding this Saturday at the 7th annual Community Connections Conference. Is your organization interested in City and federal funding opportunities? This learning lab will cover search engines for funding and address misconceptions about the rigor of applying for government funds. This lab will conclude with resources that the Promise Zone can offer community organizations and a questions and answers segment. Community organizations, concerned citizens and small business won't want to miss it. Workshop goes from 10:30 to 11:45 in room 101 E.
The Community Connections Conference is a free event with exciting workshops, speakers, panels and a delicious catered lunch. The conference will build collaborations between neighborhoods, cultural communities, residents and the City. Don't worry about cost of transportation if you fill out a brief survey Metro Transit will issue you a free bus/light rail pass. Follow this link to take the survey. When: Saturday, February 10, 2018 from 7:30 a.m. to 3:45 p.m.
What are Opportunity Zones? 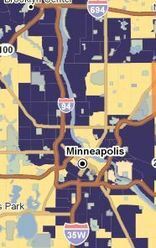 This program uses low-income community census tracts as the basis for determining areas eligible for Opportunity Zone designation. The chief executives of every U.S. state and territory have 90-120 days from December 22, 2017 to designate up to 25 percent of the total number of low-income census tracts in a state as Opportunity Zones. Read more about the role governors will play in the implementation of the program. EIG is in the process of organizing a broad coalition of organizations working together to ensure successful implementation of the Opportunity Zones program. If you are interested in learning more or becoming a part of the coalition, please contact info@eig.org. The 2017 Minnesota Joint Disparity Study examines whether there is a level playing field for minority- and women-owned firms in the Minnesota marketplace and in public procurement. Keen Independent Research LLC (Keen Independent) performed the study for the City of Minneapolis and eight other state and local government entities. The City can use study results when making decisions about programs to assist minority- and women-owned companies and other small businesses. The City operates the Small and Underutilized Business Program (SUBP) and other programs to encourage participation of minority- and women-owned firms and other small businesses in its contracts. The study analyzes whether the City’s programs are effective in eliminating any disparities in the utilization of minority- and women-owned businesses (MBEs and WBEs) in its contracts. This report is a draft released for public input, including comments received at public forums to be held in February 2017. The Executive Summary includes: A. Background on the study; B. Disparity Study research activities; C. Quantitative and qualitative information for the Twin Cities marketplace; D. Disparity analysis; E. Recommendations; and F. Public participation in the Disparity Study. The Northside Job Creation Team (NJCT) held it’s bimonthly meeting at Urban Research and Outreach-Engagement Center (UROC) this past Tuesday, January 30th. Residents of North Minneapolis have struggled to obtain employment due to a systemic deficit of living-wage jobs and large employment disparity on the Northside. Therefore NJCT, in collaboration with business owners and community leaders, has committed to attracting 1,000 sustainable-wage jobs to North Minneapolis by 2019. At the January 30th NJCT meeting, stakeholders discussed the recent implementation of a task force plan with five focus areas: workforce, entrepreneurship, executive team, transition, and business park/big fish. The workforce task force will focus on supporting NJCT partner businesses in their recruitment and training needs, and convening a forum to research major barriers, policies and practices that hinder effective recruitment and placement. The business park/big fish task force will advocate and support the creation of a North Minneapolis Business Park enabling large, established businesses to relocate/expand into North Minneapolis. The executive team will provide overall direction to the NJCT meetings and support the work of the task forces. The transition team will secure continued funding for the NJCT, including the project director and research projects, while creating a sustainable transition plan and partner engagement strategy. It is still to be determined the specific tasks of the entrepreneurship task force.The Minneapolis Promise Zone's HUD liason, Jacob Akervik, is on the business park/big fish task force and Julianne Leerssen, Minneapolis Promise Zone Manager, is on the entrepreneurship task force. If you are interested in becoming a partner in NJCT's work contact James DeSota at the Urban Research and Outreach Center. The City of Minneapolis, through its Department of Community Planning & Economic Development (CPED), is seeking redevelopment proposals for a commercial building located at 927 West Broadway along with three (3) vacant lots located at 1828, 1832 and 1838 Dupont Avenue N. Redevelopment Proposals are also being sought for a commercial building located at 1001 West Broadway. Proposals are due no later than 4:00 p.m., Friday, March 23, 2018. It is the intention of the City of Minneapolis to solicit proposals for domestic violence advocacy services to work with the Domestic Assault Unit of the Minneapolis Police Department and the Minneapolis City Attorney’s Office as part of Minneapolis’s coordinated community response to domestic violence. Tech training and good job opportunities should be accessible to everyone. That’s why Google is providing full financial assistance for qualified US residents through coursera. You must apply by February 20th, 2018 to be eligible for assistance. After completing your application, you’ll be notified about a decision within one week’s time. Upon receipt of award, learners have 14 days to enroll and will have access to the program through May 8th, 2019. Seats are limited. To qualify for financial assistance, applicants must reside in the United States of America and its territories (Puerto Rico, Guam, U.S. Virgin Islands, Northern Mariana Islands, and American Samoa), be 18 years of age or older, and must complete the full application demonstrating financial need. As Minnesota continues to diversify, ETP requires training materials to meet the needs of our changing demographics, particularly when it comes to language. DEED needs to hire a consultant to produce a series of training videos in different languages, which would be available online and at the statewide network of WorkForce Centers. These videos would inform job seekers of available training and employment programs, how to enroll, who to contact, and where to get their questions answered. The videos would also serve as a launch point to our new statewide brand roll-out. Work is anticipated to start soon after final selection of a vendor, which is anticipated to occur in February 2018. Proposals submitted in response to the Request for Proposals in this advertisement must be received through the Minnesota state procurement system (SWIFT) no later than February 12, 2018 at 1:52 p.m. CST. Late proposals will not be considered. Mailed, emailed or faxed proposals will not be considered. The Minnesota Department of Employment & Economic Development (DEED) is requesting proposals from qualified organizations for the Minnesota Pathways to Prosperity Competitive Grant. The application deadline is 11:59 p.m. Tuesday, February 13, 2018. Please find the Request for Proposals below, outlining the specific requirements of all proposals. An emailed proposal to AdultCompetitiveGrants.DEED@state.mn.us consisting of one Adobe Acrobat (PDF) file containing all required proposal components must be received at DEED no later than 11:59 p.m. Tuesday, February 13, 2018 (no faxes accepted). If you have any questions regarding the Request for Proposals or grant process, contact Ed Seel, 651-259-7595. Responses to questions will be posted throughout the grant application process as new questions come in. Mon, February 12, 8:30-11:30 a.m. Wed, February 14, 1-4 p.m.
Tues, February 20, 10 a.m. -1 p.m. Wed, February 21, 9 a.m. -2 p.m. Interested in understanding the intricacies of starting a businesses? The 2018 edition of "A Guide to Starting a Business in Minnesota" is now available from the Small Business Assistance Office at DEED. This popular guide, which is in its 36th edition and free of charge, provides a concise summary of the major issues faced by anyone starting a business in Minnesota. Free copies can be obtained in hard copy or on CD-ROM from the Small Business Assistance Office, First National Bank Building, 332 Minnesota St., Suite #200, Saint Paul, MN. This guide can also found on the DEED website. Eleven spots are open on the Council’s Equity Advisory Committee, which advises the Metropolitan Council in its work to advance equity in the metropolitan region. In forming the Equity Advisory Committee (EAC) in October 2015, the Metropolitan Council affirmed its commitment in Thrive MSP 2040 to ensure that residents and communities are full partners in making the decisions that affect them. The committee has 21 members – including members of the community and the Metropolitan Council. There are eight district representatives and nine at-large members. The co-chairs include one member of the Metropolitan Council and one community representative. Members serve four-year terms. See COUNCIL DISTRICTS DESCRIPTIONS AND MAP. District A - includes communities in northern Hennepin County and a small portion of southern Anoka County (Council Districts 1 and 2), to fill out the remainder of the term which expires in January 2020. District H – the southern three-quarters of Dakota County and southeastern Scott County (Council Districts 15 and 16), to fill out the remainder of the term which expires in January 2020. Nine at-large member, to serve 4-year terms which expire in January 2022. To apply, fill out the online application. (Some committees may also require applicants to answer supplemental questions.) For more information, or to submit your application through PDF, contact the Appointments Coordinator by email, U.S. mail or phone: 390 Robert St. N., St. Paul, 55101 or 651-602-1806. Thu, February 8, 3:30 p.m. Sat, February 10, 2-3 p.m.
Tues, February 13, 6-9 p.m.
Thu, February 15, 2-4 p.m.
Thu, February 15, 5:30-7:30 p.m.
Tues, February 20, 7 -8 p.m. Wed, February 21, 6-7 p.m.
Tues, February 27, 1:30-4:30 p.m.
For reasonable accommodations, alternative formats, or to add content please contact Jennifer Melin at Jennifer.Melin@minneapolismn.gov or by phone: 651-308-9782. People who are deaf or hard of hearing can use a relay service to call 311 at 612-673-3000.